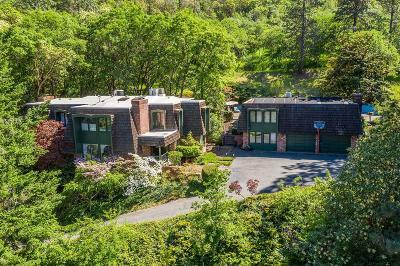 Fabulous 1970's Contemporary home with park like setting, privacy & unique qualities all situated on a 2.24 acre lot. Located at the top of Beach Street with its own Private Gated Entrance you will find the most charming property. Main home (3684sqft) features a spacious light filled step down living room, high ceilings, huge fireplace + floor to ceiling windows facing Grizzly Peak. Main level office, 1 bathroom, cozy den with brick fireplace, formal dining area, center island kitchen & breakfast room. The 2nd level offers a large Master Suite with walk in closet, shower and oversized tub with skylight. The additional 2 bedrooms and bath are also upstairs along with Laundry Room & Art Studio with exterior entrance. The wood casement windows throughout are just beautiful and offer great views of foliage, trees and mountains. The Pool House is 1bd 1ba w/kitchen & laundry. As if this isn't enough, there is also a Studio Sized Guest Unit downstairs next to the garage + Old Rustic Barn.